Bleeding hearts are flowering perennials native to eastern Asia. Plants can grow up to 2 feet tall and produce distinctive heart-shaped flowers with a long petal extending below the heart. This inner petal gives the appearance of a bleeding heart, hence the name. 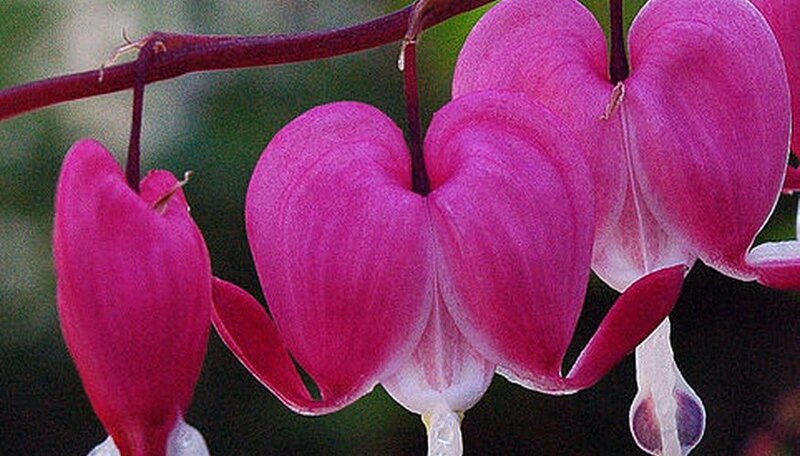 Bleeding heart plants are very easy to maintain, even for the casual gardener. They bloom in early spring and summer before dying back, and will reappear for years to come with proper care. Plant bleeding hearts in the spring or fall in an area of light to medium shade with rich, well-drained soil. Use a tiller to work organic compost into the top 12 inches of soil, and then plant the bleeding hearts at the same depth they were growing in their containers. Water bleeding heart plants thoroughly just after planting, and once per week during the summer months if rainfall is less than one inch. Water once every two weeks in spring, but only if the conditions are very dry. Generally, bleeding hearts require no water in the spring, fall or winter. Spread a 2-inch layer of mulch over the soil around bleeding heart plants to help keep the soil cool, moist and free of weeds. Bleeding hearts prefer chopped leaves or shredded bark for mulch. Reapply mulch each spring or as necessary to keep the layer about 2 inches in thickness. Apply a very thin layer of organic compost to the plants each spring. Aside from this top dressing, bleeding heart plants require no further fertilization. Pull back the mulch, apply a shovelful of compost, spread evenly and then replace the mulch. Remove bloom spikes as they fade and foliage as it dies back to promote new growth. After the first frost of fall, cut back the stems to within 2 inches of the ground. Bleeding hearts will survive the winter in the ground and emerge the following spring. Bleeding heart plants will increase in size every year, and so they should be divided every three to four years. Divide in spring when necessary, using a sharp knife to cut apart the woody crown of the main plant. Each new root section should consist of healthy buds and roots, and should be replanted immediately. Avoid using fertilizer on bleeding hearts because this will cause the plant to produce large amounts of foliage and few flowers.